Kora Radella is on the dance faculty at Kenyon College where she teaches all levels of contemporary movement practice, contact improvisation, choreography lab, and yoga. She is available to teach master classes and workshops as well as to create commissioned works. 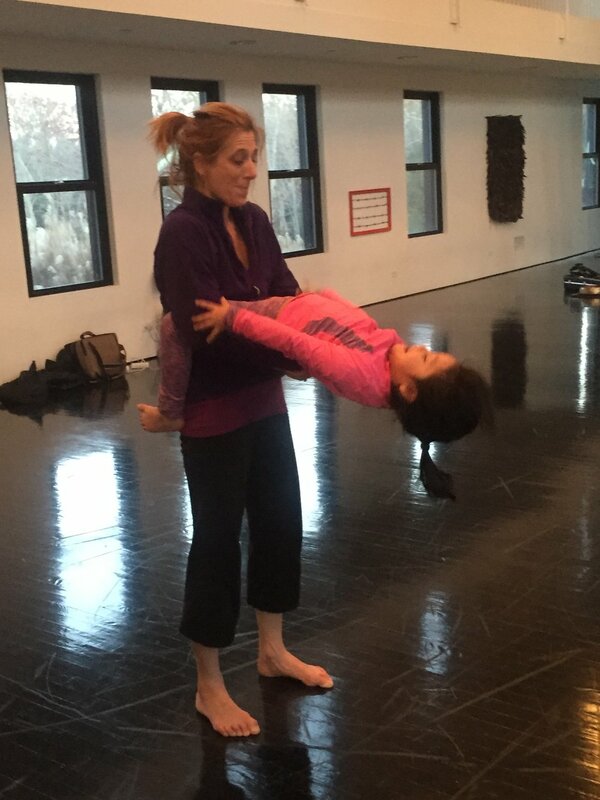 She has taught master classes and workshops at Indiana University, Oberlin College, Kent State University, Hobart and William Smith Colleges, University of Georgia, Ball State University, The Watermill Center in the Hamptons, the Somatic Center in Cleveland, through ACDA at George Washington University, the University of Akron, Ohio University, Grand Valley State, and through OhioDance at Playhouse Square (Cleveland), and Ohio State University (partial listing). She has taught in Amsterdam, Brussels, and Basel in the past as well as at Lake Studios Berlin and tragantdansa in Barcelona. I can work with you on fitting the needs of your program and/or group. The movement research of riding resilience demands athleticism and verve, as well as honoring attention to detail. There will be lively investigations that utilize strength and release to create physical necessity and follow-through in our movements. Full-throttle motion via momentum- based phrases will nurture both disorientation and point-on-precision. Movers will experience the delightful nuances and the empowerment of moving on the edge of control! This workshop will focus on partnering and duet work. Utilizing skills from contact improvisation and athletics, participants will research duet work that comes from physical necessity v.s. decorative posturing. We will hone in on ways to work with a partner that challenges them physically while offering attention that chisels away at artifice and discovers primal human interactions that require active listening and empathy. Kora Radella can create movement experiences that ignite a genuine passion for moving, accommodating all levels of experience. She has extensive experience teaching and working with children, teenagers, college students, and the elderly. Radella has a certification in gerontology. This workshop will guide participants in the assimilation and deployment of their inner resources to explore movement invention that reflects and challenges each person’s movement history. This material will be integrated with explorations of how to be a fully present, live body. Participants will be further guided in the creation of solo works that both honor their backgrounds and stretch them beyond their comfort zones. Working towards physical necessity and making motion matter through subjecting oneself to precarious balances via momentum and three-dimensional disorientation, the participants will discover a mix of full physicality and sensitivity that is essential to Radella’s work. Generating text and movement will be approached through a variety of techniques that allow for the exfoliation of creative possibilities for both verbal and nonverbal communication. Strategies for creation, as well as editing, will be key in this workshop. For this workshop, it is possible to include Chris Siebert, a Cleveland-based theatre artist. Seibert and Radella have an evening-length work they perform entitled Reckoning. A workshop or master classes in tandem with composer/saxophonist Ross Feller can cover Improvising with live musicians, collaborating with composers and musicians, movement for musicians, sound for movement artists, and a number of other strategies to this combination. Lecture demonstrations are customized according to audience and location. Radella can share choreographic excerpts, discuss her movement research, shed light on her creation process, and expound upon how she collaborates with composers, musicians, theatre artists, and visual artists. custom design a program to work with a diverse array of people and within alternative spaces. set works on companies and individual performers. be accommodated and housed while creating new work with performers she brings in, as well as teaching classes and sharing the creative process through showings and feedback sessions. “Kora’s ease with us Seniors, and her sharing her own experiences, made us virtually jump in with our own journeys. Her perception of our moves while we each shared a story, mirrored back to us movement we may have been unaware of. What a rich feeling! Mining our memories and our brains, Kora provided us with the choice of moving in space or dancing in our chairs. Wishing we had more time: time to remember and move through more decades of our lives. Keep celebrating with Seniors, Kora!” - Hampton Bays Senior Center workshop participant Ann Coppola.